Please be patient while images load. Thank you! Please do NOT copy my designs! They are the results of my creativity and hard work. 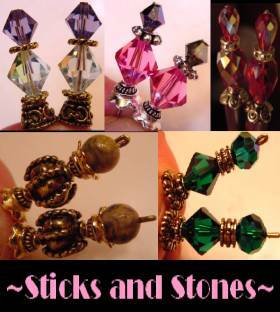 Handcrafted hairsticks that fit in your budget! Something for everyone can be found here. New sticks are added regularly, so please check back often! Sticks come in custom lengths, so one size doesn't have to fit all! When you place your order, simply specify what length stick you are interested in. You pick the topper, you pick the stick style and length, you create a special stick that suits you perfectly!! The options are limitless! If you don't see something online that suits you, custom created orders are our specialty! Prices always include FREE shipping within the US! For orders outside the US, please let me know. Shipping is usually still covered, however, in rare cases it may not be. For specifics, just email me. If you would like insurance added to your package, you will be required to pay only the actual insurance fee. To place an order, please email me with: topper name, type of stick you want, length of stick you'd like, as well as the payment option you'd like to use. PayPal, Money Orders, and Personal Checks are accepted. Unfortunately, due to past experiences, orders paid for by personal check will have a waiting period until checks clear. Thanks so much for helping to support the Loom with your purchases! How do I use Hairsticks? Newest stick listings can be found on our "new sticks" page! 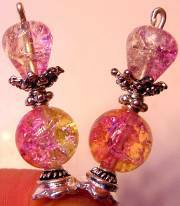 Be sure to visit for the latest designs! 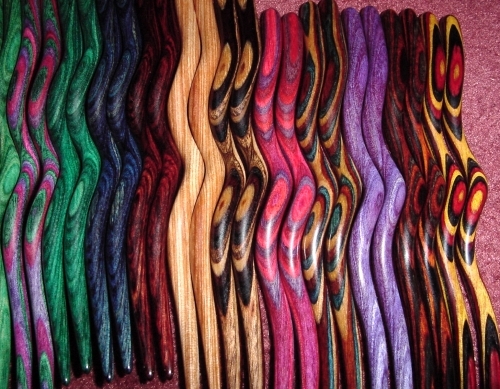 From left to right shown in all three sizes: Cocobolo, Lacewood (now discontinued), Gonalco Alves, Purpleheart, Moradillo, Bocote, Walnut, Cardinal, Kingwood, Canarywood, East Indies Rosewood, and Honduran Rosewood. Also available: Gabon and Macassar Ebony woods, Tulipwood, and Pink Ivory. 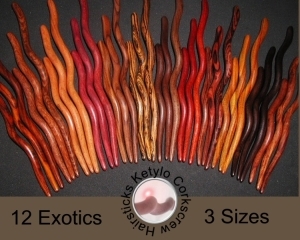 Ketylo Corkscrew Spiral Sticks in Exotic hardwoods and Dymondwood colors- available plain in lengths of 5 inches for $13.00 per single, 6 inches for $14.00 per single, and 7 inches long for $16.00 per single. 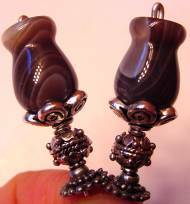 Also available "crowned" for $38.00, $42.00, $46.00 per pair (half that for singles). More details on stick pages! This is the only place to get Customized Crowned Ketylos!! You pick the wood, you pick the length, you pick the topper!! Custom lengths available on topped sticks. A note about Dymondwood colors. These are considered waterproof and can go in soaking wet hair! A great option if you are having to put your hair while it's still wet or damp!  We do have some additional colors not shown here, like Ironwood, Sunny Skies, and Tropical Passionwood - a beautiful bright pink! Please ask about colors you might be interested in, but are not shown here. Straight Wooden Sticks, available in all lengths up to 6 inches. Price is included in cost of topper. 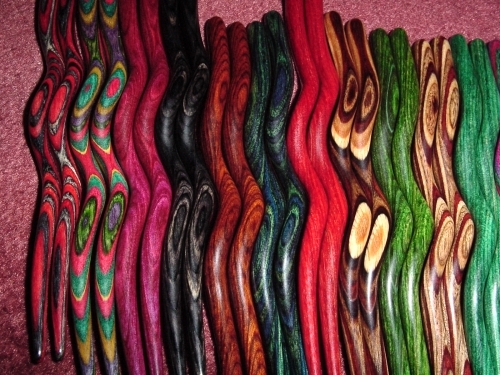 Straight Rosewood sticks available in lengths up to 6.5 inches on average, sometimes longer. Additional fee added to cost of topper of $4.00 per pair. Smooth bone sticks in black are also available in limited supply. Additional fee added to cost of topper of $2.00 per pair.